Supply and Demand (in that order): Fiscal Policies and the Prices of Labor: A Comparison of the U.S. and the U.K.
Fiscal Policies and the Prices of Labor: A Comparison of the U.S. and the U.K. Many countries of the world experienced an unusually deep and long recession after 2007. Over the same time frame, several facets of fiscal policy were changed, especially policies related to taxation and safety net programs. The purpose of this paper is to compare changes in fiscal policy parameters as they affected the incentives of middle-class Americans and British to be employed. The U.K. had a “stimulus programme” followed by an “austerity programme.” The U.S. federal government also passed what it called a “stimulus package,” followed by a major health reform. Policy labels acquired during legislative processes are not necessarily indicative of economic fundamentals. This paper comparably quantifies fiscal policy in terms of one of the fundamentals: the wedge between the supply price of labor and the demand price of labor. It finds that the two countries have been different in terms of the evolution of employment taxation, on average and across demographic groups. The American stimulus reduced average incentives to be employed by increasing cash and health benefits for the unemployed and for families with low incomes, whereas the British stimulus did the opposite by temporarily reducing its value-added tax rate and permanently reducing its basic income tax rate. The British austerity program pushed incentives in the opposite direction as its stimulus by permanently increasing its payroll and value-added tax rates. The evolution of employment has also been different in the two countries. Figure 1 displays an index of each country’s employment rates for prime-aged people. 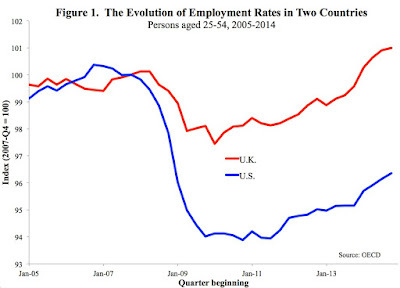 [i] Employment fell sharply in both countries during the crisis, although less so in the U.K. The U.K. employment recovery began earlier, and by the end of 2014 the U.K. employment rate had exceeded pre-crisis levels. Because taxes are one (among many) of the determinants of labor market performance, comparable tax measures are necessary for carefully investigating and comparing labor market outcomes. This paper provides tax measures, and shows how changes in tax rates are linked to specific legislation. I follow the usual steps of public finance analysis and first look at the tax wedge – the gap between supply and demand prices created by a tax or subsidy. The next step, left for future research, is to draw conclusions about the wedge’s behavioral effects and ultimate incidence. Thus, with one exception noted below, the estimates in this paper do not require any assumption about the relative incidence of labor taxes on employers and employees. Section I discusses the United Kingdom, demonstrating how many of the tax changes were ultimately offsetting in terms of the employment incentives they created. The primary exception relates to the subpopulation receiving child tax credits, because the phaseout (sometimes referred to as “taper”) rate of those credits increased with little change in the range of incomes over which the phaseout applies. Section II shows results for the United States, where employment disincentives have increased over time, especially (but not exclusively) among unmarried workers. Section III shows the evolution of the employer cost and employee benefit from work – the gap between the two is the employment tax wedge – by country for workers in the middle of the wage distribution. Section IV concludes. [i] Both series are from the Organization for Economic Co-operation and Development (hereafter, OECD), via the St. Louis Federal Reserve’s FRED database. 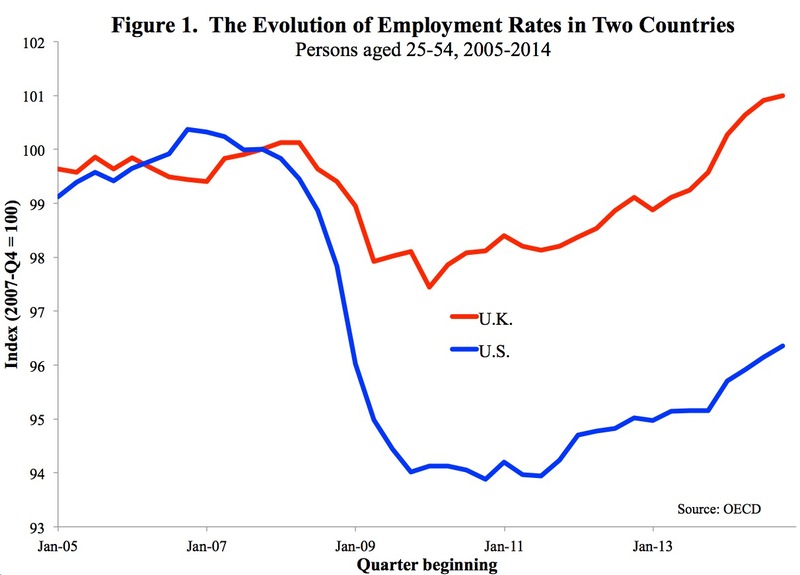 In 2007-Q4, the U.K. and U.S. employment rates were 81.5 and 79.8, respectively. [ii] Average quarterly gross flows are from Gomes (2012, Figure 1), for 1996 through 2010. Quarterly net employment changes are from the OECD, via the St. Louis Federal Reserve’s FRED database, and, for comparability with Gomes, for the age 16-64 age group. [iii] The St. Louis Federal Reserve FRED data series UEMPMED shows that the U.S. median duration of unemployment peaked at 25 weeks in June 2010. Also note that, for example, an 18-month nonemployment spell lasting from March 2009 to September 2010 nonetheless involves positive weeks worked in both calendar years (tax years in the U.S. coincide with calendar years).